Norma Técnica para Diseño por Viento (El Salvador, 1997). The end of the column is situated at the bottom surface of the floor slab or beam of the floor above. The end of the column is situated at the top surface of the floor slab or beam of the floor above. 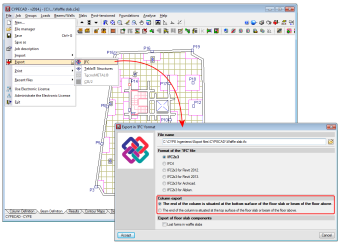 The analysis and code justification of the new CTE HE 1 for new building projects or extensions of existing buildings for private residential use were implemented in the 2014.i version of CYPECAD MEP, within the “Thermal study tab”. More information can be found on our Spanish webpage . CYPETERM HE, which can be accessed from the main CYPE software menu (installation in Spanish or in Catalan), was implemented in the 2014.i version. CYPETERM HE has been created to help project designers comply with the “exigencia básica HE 1 de Limitación de la demanda energética”, which has recently been renewed in Order FOM/1635/2013 of the 10th September, updating the DB-HE “Ahorro de Energía”, of the Spanish Technical Building Code, which was approved by Royal Decree 314/2006, of the 17th March.